Canberra is the capital city of Australia. The city is located in the Australian Capital Territory (ACT), an enclave in the south-east of New South Wales. Canberra is a planned city, with national monuments, museums and galleries built around a large artificial lake. As a bush capital, Canberra is also a great place to enjoy the outdoors, with excellent cycling, gardens, parks, bushwalking and nature reserves. Canberra was established in 1913 as the capital for the newly federated Australian nation. The ACT was excised from New South Wales and put under the control of the federal government. The creation of the planned city was not without critics who claimed it was a "waste of a good sheep pasture". Canberra's design was conceived by the American architects Walter Burley and Marion Mahony Griffin, built on the shores of an artificial lake (Lake Burley Griffin). Populated at first largely by politicians and public servants, it took time to develop its own identity and culture. Extensive building of national facilities and a concerted effort to develop public institutions in the city have made it an interesting destination. Lake Burley Griffin divides central Canberra. The central shopping and commercial area, known as "Civic", is on the north side and the parliamentary triangle and embassy area is on the south side. 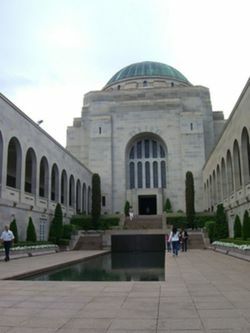 National institutions are likewise divided, examples being the National Museum of Australia and the Australian War Memorial on the north side and the National Library and National Gallery of Australia on the south side. There are suburbs surrounding central Canberra, and also suburbs surrounding several outlying town centres. These town centres are, Belconnen and Gungahlin to the north, and Tuggeranong and Woden to the south. The ACT also has surrounding towns, such as Murrumbateman, which boasts a strong cool climate wine selection. The historic village of Hall is also on the outskirts of Canberra. It had a population of 395,790 people at the time of the 2016 Census . Australian Capital Territory follows the same time as New South Wales that surrounds it. It's 10 hours ahead of GMT (UTC+10) and 11 hours ahead (UTC+11) during daylight saving (first Sunday in October and ends the first Sunday in April). Many people who live in Canberra are not originally from Canberra, having usually moved there to study or take up employment with the Australian Government. A common pattern is that people from other parts of Australia move to Canberra, study or work for a few years and then return to their place of origin or move on to elsewhere. As this means a constant influx of new arrivals to Canberra, you should not be reluctant to ask for directions and the like from locals - they are more than used to it and usually only too happy to help. Canberrans on the whole are easygoing, friendly and tolerant people who have the highest levels of education and income in Australia. Ethnically, Canberra's population is more diverse than most regional areas of Australia, but nowhere near as culturally and linguistically varied as Sydney and Melbourne. Source: Bureau of Meterology . 1939-2010 average. Canberra can get just as hot as anywhere else in Australia during the summer months, with temperatures above 30ºC a frequent occurrence from December through to March. It can get bitterly cold during the winter months (June-August) owing to its altitude and proximity to the Snowy Mountains. Overnight temperatures in winter frequently drop below zero and tend to hover slightly above 10ºC during the day. However, it is usually a clear, brisk cold, and rarely a dull, damp cold. Canberra is less humid than Australian coastal cities. The hottest days are often mitigated by welcome, cooling, mountain breezes, particularly towards the end of the day, and the temperature drops overnight. The comprehensive visitor centre has recently moved to Regatta Point on the north shore of Lake Burley-Griffin. It shares a building with the National Capital Exhibition. ☎ +61 2 6205-0044. Canberra International Airport (IATA: CBR) is well served by flights from other Australian capital cities. Its always been known as Canberra International Airport, although international flights only resumed in 2016 after a long absence. There are flights almost hourly to Sydney and frequent flights to Melbourne. Other capitals may see only a morning and evening flights. A flight from Sydney to Canberra only saves an hour or so over driving from Sydney and for those who are not coming from an area close to Sydney Airport, air travel offers only a marginal time saving. Virgin Australia flies to and from Sydney, Brisbane, the Gold Coast, Townsville, Melbourne, Adelaide and Hobart. Qantas flies to and from Sydney, Brisbane, Melbourne, Adelaide, Darwin and Perth. Flying time is 50 minutes from Sydney, 1 hour from Newcastle, Dubbo or Melbourne, 2 hours from Brisbane and Adelaide, and 4 hours from Perth. Flights from Canberra to Wellington depart at 11:00 hrs on Monday, Wednesday, Friday and Sunday. The return leg operates on the same day. Flights from Canberra to Singapore depart Canberra at 00:35hrs on Monday, Tuesday, Thursday and Saturday. ACTION buses, the local public bus company, has recently added an airport service. Routes 11 and 11A leave at least every half hour during operating times and travel directly to the City Bus Station. The services are still somewhat erratic, and the last service is in the early evening, so best to check the timetable . Tickets are $4, including a transfer. There is a private bus service provided by the Royale Group  for $10 one way into the city, with no discount for return. Taxis are available in front of the terminal towards the Qantas end for around $25 to Civic. It is possible to use Canberra's offroad cycleway network to access the airport. Follow the cycleway along the north side of the lake. A section of cycleway was recently completed alongside the Molonglo River underneath the Monaro Highway Bridge which veers left and passes underneath the Pialligo Avenue bridges. Turn right, cross the creek (beware of the gravel surface at this point), cross over Fairbairn Avenue, use the airport service road through the airport precinct, and make your way to the terminal. There is a long stay and short stay car park, both within walking distance of the terminal. Expect to pay around $17 per day to park at the long stay. The long stay is cheaper than the short stay only if you park for a day or more. There are convenient scheduled international services to Singapore and Wellington, New Zealand, on Singapore Airlines. International visitors can also fly to Sydney, Melbourne or Brisbane and transfer to connecting flights. There are coach services to Canberra non-stop and direct from Sydney International Terminal taking around 3.5 hours. The last coach leaves Sydney airport at 19.15 Monday to Wednesday, 20.15 Thursday to Saturday, and 21.15 on Sunday. NSW Countrylink  runs from Sydney to Canberra three times a day, morning, midday and afternoon, every day in both directions. The trip takes just over 4 hours, which is slower than a bus or driving, but the train takes a very scenic route through the Southern Highlands and the Molongolo Gorge, compared to an unexciting freeway journey by road. The train arrives in Kingston on the south side of Canberra, a pleasant 25-30 minute walk from the closest of the attractions on the south side of Lake Burley Griffin. 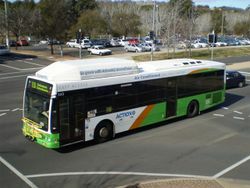 Buses connect the station to Civic (the Canberra CBD) on the northern side of the lake, ACTION buses pass the station every 15 minutes on weekdays (routes 200 and 80) and every hour on weekends (route 980). Cash fares cost $4, and are good for anywhere in Canberra for 1.5 hours. The tap on tap off MyWay card is much cheaper especially off peak and weekends. Taxis and coaches to further destinations meet each train arrival. It is possible to do a day trip from Sydney and get 5-6 hours to spend in Canberra. Bicycles must be boxed and checked as luggage on CountryLink services and cost $12.10 per bicycle, and there is room for only three on any train. 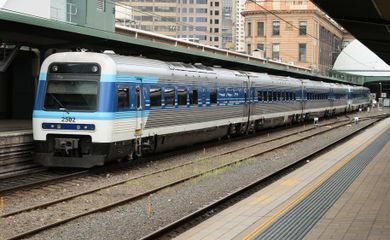 The economy train fare is $40 year round, bookings are essential but the train is rarely fully booked except around annual holidays, There are no discounts except for seniors, students, unemployed and people on disability pensions, who pay half fare. If you are enthusiastic about train travel, desperate to save money, travelling from Sydney and wish to see Goulburn on the way, the Cityrail train to Goulburn costs $7.80, and the Countrylink train from Goulburn to Canberra costs as little as $11. Countrylink also runs a once-daily train/bus between Melbourne and Canberra: the bus runs from the centre of Canberra (City Bus Interchange) via the Barton Highway, Burley Griffin Way and the Olympic Highway to the town of Cootamundra, where travellers switch to the XPT (Countrylink Train) to Melbourne's Southern Cross Station; tickets cost $91 in off-peak and $107 in peak season. V/Line runs an alternative train/bus service between Melbourne and Canberra: the bus runs from the Jolimont Centre coach terminal (across the road from the City Bus Interchange). This service is called Canberra Link. The bus runs to Wodonga, from there a V/Line train will take you through to Melbourne's Southern Cross Station. Northbound, the reverse applies, train from Melbourne to Wodonga or Albury and bus to Canberra. Tickets cost $46. This is the better option and takes eight hours. You can travel with or without reservation but reservation guarantees you a seat on both the coach and train. V/Line also run a Canberra service via the NSW and Victorian south east coast to connect with the Melbourne train at Bairnsdale. This service is called Capital Link. Services run twice a week (three times a week during Victorian school holidays). At Bairnsdale, a road coach will take you via Orbost, Cann River and Cooma to Canberra, with stops at Canberra Railway Station (Kingston) and the Jolimont Centre (across the road from the City Bus Interchange). Tickets on this service also cost $46. All coaches to Canberra stop at the Jolimont Centre, in the city centre and immediately across the road from the Canberra local bus (ACTION) interchange. The burgers at the Coach station are worth trying, for their sheer size. Murrays , tel 132251, Murrays operate up to 10 daily express services between Sydney (Central Station) and Canberra with extra services on peak days. They are the main operator on this route. Service takes just over 3 h. They always have $15 fares available on the web, for the early or late services and $18 for some others. Popular services or last-minute booking is around $35. The service is non-stop (with some services via Sydney International Airport). Murrays also run a daily service from Canberra to Wollongong and Canberra to Narooma. The coaches are more cramped than the trains. Seats are unassigned, so it helps to be there early and not to have luggage to go under the bus, as that lets you get on first and secure your window seat. Buses often fill to capacity, and can experience delays due to peak traffic into and out of Sydney, although the non-stop nature means that they have been known to run 10-15 minutes early on a good run. Greyhound Pioneer , tel 131499, operate a bus service competing with Murray's. Fares seem to be either $15 or $36, so you might get lucky and get a cheap ride. Note that it may not be possible to get the $15 fares when booking a return journey; if so, you probably need to book each leg separately. They also offer a direct service to Melbourne. Greyhound's coach services usually include video entertainment. The Greyhound services have stops which make the service slower than Murrays'. NSW Countrylink also run daily buses to and from Eden on the South Coast, via Bega and Cooma. The drive from Sydney to Canberra is 290 km and takes around three and a half hours from the Sydney CBD, less from outer suburbs in Sydney. The road is dual-carriageway, mostly freeway-like conditions from the Harbour Bridge all the way to Canberra, mostly with a 110km/h speed limit, via the M5 Motorway, Hume and Federal Highways. There are three sets of on-road services located on the Hume Highway between Sydney and the turn-off to the Federal Highway to Canberra, as well as many well-maintained and often scenic rest stops with toilets and picnic tables ideal for a picnic. Take drinks, as the rest areas have no water, or tank water which is not recommended for drinking. A third option which will enable you to see more of the countryside is to stop at one of the small towns in the Southern Highlands on the way which will have a cafe or two. It is rare to make the entire trip between Canberra and Sydney without at least one police speed trap. The city of Goulburn, on the way to Canberra, is the training centre for New South Wales police officers and often send new recruits to run speed checks on the freeway. There are also several fixed speed traps, all of which are signposted in advance. The drive from Melbourne to Canberra is 650 km and takes roughly eight hours on the Hume and Barton Highways, again mostly on dual-carriageway roads. While Canberra on the whole is not walkable by any standards, some parts of it, including Civic and the central part of the northern shore of Lake Burley Griffin, as well as the sights at the southern shore of Lake Burley Griffin, are possible to tackle on foot. For transfers between suburbs, the best options are the bus, the car, and the bicycle. ACTION buses  cover the majority of Canberra. Fares are $4.90 for adults and $2 for concessions. An all-day ticket costs $9.00 for adults and $3.80 for concessions. If spending more than $20 on tickets, you may want to consider purchasing a MyWay stored value card. It offers discounts on single tickets, monthly and weekend all-day travel. However, there is no discount on weekday all-day tickets. The inter-town routes are frequent and reliable, especially during peak hour, but are often crowded. Other services can be infrequent, particularly in the off-peak and weekends. Check timetables carefully. If you need to change buses to get somewhere, ask for a transfer ticket; it will let you on to as many buses as you need within 90 min of getting on the first bus. Tell the driver where you need to get to, and ask them what your options are. Some buses snake through the suburbs and can take a while to cover a relatively short distance while others may be more direct or express services. To travel between the interchanges (Belconnen, Civic, Woden and Tuggeranong), catch any bus in the 300 series (300, 312, 313, 314, 315, 318 or 319) as these are much faster than other buses. Note that this service runs as 900 on weekends and public holidays. Buses do not operate between midnight and 6 a.m. Monday to Saturday or after 7 p.m. on Sundays and public holidays. Many buses (including inter-town routes) have a push-bike rack on the front, and the passenger can put the bike there to get to another bike-friendly destination. Bicycles are a practical way to get around Canberra while visiting, and will get you to most attractions using a well developed network of off-road cycle paths. Functional bicycles can be bought cheaply from The Green Shed  at the Resource Management Centre (tip) at Mugga Lane, Symonston and Flemington Road, Mitchell, expect to spend around $30 and bring an air pump and puncture repair kit. Canberra also has generally well developed on-road cycle facilities but the on-road cycle lanes do sometimes end and start in utterly inexplicable places. The grade can be a little steep as away from central Canberra is fairly hilly, but all the attractions around the lake are accessible on fairly flat paths. Pedal Power  has a list of commuter and other routes. Bicycles are also permitted on footpaths in the ACT (except when passing shops during trading hours). There are bike racks to lock your bike up at most shopping centres and points of interest. Bike helmets are compulsory. The intertown buses will carry two bikes on bike racks on the front of the buses. The bike racks have clips, so no additional equipment is necessary. Only 20" tyres or larger bikes are carried. There is no charge for using the bike rack. Kids must be accompanied by adults, and child seats and other accessories must be removed from the bike. A bicycle path map bought from a visitor information, petrol station or newsagent also shows bike paths and on-road cycle lanes. The map is also online at the ACT Department of Planning . Drivers are often confused by the many signs around Canberra that direct you to the "Town Centre". The unanswered question that the sign poses, is "Which Town?". The city centre, also known as "Civic", is its own centre, but the other Canberra "towns" are Belconnen and Gungahlin (to the north of the lake), and Woden, Weston Creek and Tuggeranong (to the south). Each of these towns has its own suburbs. You will see signs directing you to each of these towns, but once you get closer the sign will simply direct you to the "town centre". You need to know which town you are in for the sign to make sense. Most attractions in Canberra provide parking at no extra cost, However paid parking (AUD$9.50-$14 daily) has recently been implemented within the central suburbs. Canberra roads are generally of excellent quality and relatively uncongested. The default speed limit on all roads in the ACT is 50km/h, unless signposted otherwise. Major roads in the ACT will have 60-100km/h speed limits in 10km/h intervals. There is little rhyme or reason regarding how a speed limit is set in the ACT, with similar roads having vastly different speed limits. In some situations, the same road will have a different speed limit for traffic heading in oposite directions. Speed limit signs within the ACT tend to be spiradic and intermittently placed. Several major limited access roads like the Tuggeranong Parkway (between the City and the town centres of Woden, Weston Creek and Tuggeranong) are 100km/h, though others are 80-90km/h. The ACT also has the highest amount of speed cameras per capita in Australia. Fixed speed cameras have plenty of warning signs in advance via overt signage. Red light/speed cameras have much smaller warning signs, usually not coupled with a sign reminding of the speed limit. Mobile speed camera vans operate on major roads in the ACT. These may be overtly or covertly parked, and may be identified by a large white sign on the roof. Motorists should watch out for 40km/h school zones which in Canberra are active throughout the school day (8am-4pm) (unlike surrounding New South Wales where they only operate for an hour or two at the beginning and end of the school day). School zones are rigorously policed. The main shopping and commercial area of Canberra is known as Civic, but you will never see a signpost to Civic. It is signposted as "City". Take change for parking meters in Civic if you want to park on the streets or in the government parking lots. Parking in the CBD can be difficult on weekdays, due to development of carparks and encouragement to take public transport. There are several multi-level carparks near the Canberra Centre with ticket pay-stations and pay-booths. Note that all day parking in the Canberra Centre is cheaper on the rooftop level. You will need to collect a parking entry ticket from the first boom gate and then feed the ticket into the second boom gate as you enter the rooftop level. Fixed speed traps in Canberra are highly visible with multiple signs informing motorists that they are approaching a speed trap. However, mobile police speed traps are set up in large, highly visible white vans with police signage informing motorists that their speed has been checked. Many red light cameras double as speed cameras regardless of whether a red light infringement has occurred. The signage for these speed cameras is substantially less visible than the signage for standard speed cameras. There are remarkably few fuel stations on the main roads. Instead, they tend to be located near local shops, off the main roads. Look for the small blue fuel pump signs pointing off the main roads. Start looking well before you run too low. There are several petrol stations just east of Northbourne Avenue at Civic. In the suburbs of Tuggeranong, the "Monaro Highway" is signposted as a destination on numerous signs for the three roads that head east-west. The Monaro Highway is actually a north-south road to east of Tuggeranong Town, and the intended meaning is that the road is an appropriate route to the Monaro Highway. Australian War Memorial, Treloar Crescent (top of ANZAC Parade, at the other end from Parliament House), ph +61 2 6243-4211 or +61 2 6243-4598 (for recorded information), fax +61 2 6243 4325, . Daily 10AM-5PM. Not just a memorial, this is one of Australia's premier museums, covering Australian military history from Federation to the present day and including fascinating exhibits of equipment, memorabilia and battle dioramas. You could easily spend a full day here (it has a café, or bring a picnic lunch if the weather is nice and sit on the lawns at the front). Anzac Parade, leading up to the War Memorial has a number of memorials to different wars and those involved in wars. Free entry, allow 4-7 hours. National Capital Exhibition, Barrine Dr ( in Commonwealth Park (off Commonwealth Avenue)), , open 9-5 Mon-Fri, 10-4 Sat-Sun. See an exhibition about the original Burley Griffin Plan for Canberra and how the city was planned and built. Good views over Lake Burley Griffin out to the museums on the Lake's south shore. Free. National Film & Sound Archive, McCoy Circuit, Acton, ph +61 6248 2000, . A unique collection of Australian sound and film recordings of which a small selection showing iconic moments in Australia's cultural history is explored in this museum. National Museum of Australia, Lawson Crescent, ph +61 2 6208-5000, fax +61 2 6208-5099, . This controversial museum has lots of interactive exhibits and groups items by concept rather than era. Free admission except for special exhibits. Allow 2-7 hours. Australian National Botanic Gardens, . Located at the base of Black Mountain in Acton, the ANBG has the largest collection of Australian native flora in the country. It also has some interesting water dragons that live in the water features around the gardens. A delightful place for a picnic, try to grab some food from the city centre first to take with you for lunch. If you are there during summer, call and ask about the jazz evenings. These are held on the weekend and many families attend with evening picnic and champagne in tow, to chill out to the sounds of jazz in the balmy evening temperatures. Entry is free, however parking is $1.40/hr or $7 all day at ticket machines, with proceeds going towards the gardens. High Court of Australia, Parkes Place, Parkes, , 9:45-4:30 Mon-Fri (not open weekends or public holidays). This vast building is the home of Australia's highest court and contained a vast lobby and three main courtrooms that are open to the public. Tours are available, though restricted when the court is sitting. There is a cafeteria in the building as well. National Gallery of Australia, Parkes Place, Parkes, ph +61 2 6240-6502, . 10AM–5PM. Located by Lake Burley Griffin, this modern structure is one of the country's largest art galleries. It has a vast collection of paintings and sculptures collected from Australia and the rest of the world and has excellent Aboriginal artwork. A nice gift store and a large bookstore on the ground level. Free except for special exhibits. The Gallery offers free public one-hour tours: Australian and International art at 11AM and 2PM daily, Aboriginal and Torres Strait Islander art at 11AM on Thursdays and Sundays. Allow at least half a day and possibly more. National Library of Australia, King ph +61 2 6262-1111, fax +61 2 6257-1703, . The library is primarily a research centre, but normally has one exhibition showing parts of the collection. Also notable for its neo-classical architecture. Old Parliament House (featuring the Museum of Australian Democracy), King George Terrace, Parkes ph +61 2 6270-8222, fax +61 2 6270-8111,  . The headquarters of Australian government from the 1920s to 1988, this building is a must for political and/or historical junkies. The building gives a real feel of what it was like when it was in use and has in the past regularly featured rotating exhibitions on the controversies and scandals that rocked Australian politics. It is now a permanent museum. Most of the main rooms - the Prime Minister's office, the Cabinet Room, the various party rooms, the two houses - are open to visitors, as are many smaller rooms like the whips' offices and the broadcasting area. There are also historical photos of Canberra as it used to be, including the times prior to the creation of the artificial lake that show Canberra under snow during winter (the lake warmed up the city and snow falls rarely on the city now). The gift store has decent souvenirs. Parking is free, admission is A$2 for adults, A$1 concession. Allow 2-3 hours. Parliament House of Australia, Capital Hill (access from Commonwealth Avenue), ph +61 2 6277-5399 or +61 2 6277-2727 (for recorded information), . The seat of Australia's federal government and legislature and a remarkable piece of modern architecture. Tours are available (you must pass through a security check) or when Parliament is sitting you are allowed to view proceedings in the public gallery (another security check is required for this, and expect queues and long waits around 2PM on sitting days for "Question Time" in the House of Representatives. The Senate is likely to be less busy but less exciting.) Allow 2-3 hours. Questacon - The National Science and Technology Centre, King Edward Terrace, Parkes, ph +61 2 6270-2800 or 1800 020 603 (free call, recorded information), . 9AM-5PM. Questacon is an interactive museum of science with exhibits illustrating scientific ideas from the principles of physics to the motion of an earthquake. Great for kids and excellent science books can be picked up here. (Jun 16) $23.00 adults, $17.50 concessions, $17.50 children, and $70 for a family of 2 adults and 3 children. Allow at least half a day. Embassies. As the national capital, Canberra hosts the embassies of most countries, listed below in Embassies. 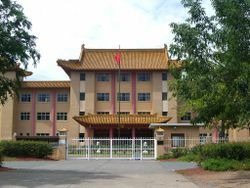 Most of the embassies are built in an architectural style typical of that particular country. In Yarralumla (the closest embassy district to the city), the Embassy of China, Embassy of Papua New Guinea and , The Royal Thai Embassy are particularly worth a look. The Embassy of the United States of America is also worth a drive past, being the oldest embassy in Canberra. It is best to have a car or bicycle for touring so you can stop and have a look around. Mount Ainslie (off Fairbairn Avenue, Campbell/Forrest) - vehicular access available. This is the most classic Canberra view looking in a straight line over the War Memorial, the lake and Old and New Parliament House in the background. Mount Majura (access via Antill St in Watson, also service road off Majura Road) - no vehicular access, walking tracks only. Mount Taylor (access via Waldock St, Chifley) - partial vehicular access; to reach the top you will need to walk. Mount Pleasant (via General Bridges Drive, Duntroon) - vehicular access available between 7AM and 7PM. Floriade  festival of flowers, a yearly event held in spring (September-October), not to be missed. 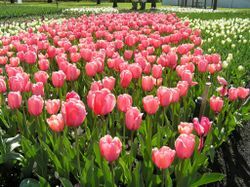 Tulips are the main feature but many other colourful flowers and floral displays are featured. There are also sculptures, garden stalls, makeshift restaurants, activities, live music by local performers and sometimes there is even a gnome or scarecrow festival where children (and some adults) paint gnomes or make scarecrows and enter a competition to choose the best. Great for a photo opportunity! Summernats  is a festival of modified cars, car cruising, burnouts, etc., which takes place first thing in the new year. If you are not into this culture, this is a good time not to be in Canberra, as even the most civilised hotels are overtaken by drunken 'nats'. Thai Food & Cultural Festival Annual festival held in September (Sun 22 September 2013) at The Royal Thai Embassy in Yarralumla. The Festival is a bonus for floriade visitors and Canberrans alike and it's the Embassy's biggest free event of the year. Exotic event hall and beautiful court yard with 2 outdoor stages for live performances plus Thai food & beer, "made-in-Thailand" products, and fun & games for children. Do not miss this! The Philippines, Sri Lanka and some other embassies do similar events sometimes. Diplomatic Charity Bazaar - held occasionally. Great place to buy original things specific to various countries, sold by staff of the embassies. The National Folk Festival - held every Easter over 5 days, featuring local, national and international folk musicians, dancers and craftspeople. The Canberra Show  is held each year in February and features shows, amusement park rides and agricultural competitions. It has most of the features of the Sydney Royal Easter Show, but on a smaller scale with less crowds. Check out the Canberra Times  newspaper on Saturday for upcoming events. The majority of the Australian Capital Territory is actually not Canberra city and there is a large area of national park. While most people don't spend any time outside of the city there is plenty to do if you want to get away from the museums and attractions for a while. Alternatively, take a scenic cruise on the lake with Lake Burley Griffin Cruises . Phone 0419 418 846. Capital Bicycle Hire , which rents high quality mountain bikes and runs tours around Canberra's extensive bicycle path network and off-road trail system. Phone 0412 547 387. Ride Canberra's Mountain Bike Trails: Canberra offers a large number of Mountain Biking locations around Canberra, many of which are considered some of the best in Australia. See Canberra Off Road Cyclists (CORC ) for locations. Canberra is also home to the largest 24 hour Mountain Bike Race in the world (Scott 24hr ), held in early October each year. 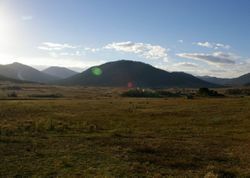 Explore Tidbinbilla Nature Reserve  is about a 40 minute drive south of Canberra via Tuggeranong Parkway and Tharwa Drive. You can take Ranger-guided walks or have fun with the hands on displays such as the interactive computer program on Tidbinbilla's bird species and look at the live animal displays. The gift shop sells an interesting range of clothes, toys, books, cards and souvenirs. Coffee and light refreshments are also available. See the stars and planets at Mount Stromlo Observatory , Cotter road, Weston Creek. ph +61 2 6125-0230. Mount Stromlo is Australia's premier astronomical observatory. Badly damaged in 2003 bushfires, the partially rebuilt observatory reopened in October 2004. They run a Saturday night star gazing event for the public, call +61 2 6125-0232. The site's damaged buildings and equipment remain and may be fascinating for tourists. Go wine tasting in the Wineries around Canberra (most are outside of the ACT but all very close to Canberra). They are described as cool climate wines and some are very well known and regarded. Try Jeir Creek, Gallagher, Clonakilla and Lark Hill, just to name a few. There are '33 wineries within 35 minutes of Canberra'. Visit the Canberra Wineries website for more information . Head south to Tharwa, and then take the road to Adaminaby. The road is very good for all of what I describe, any car can go on it, but further south than what I describe requires a 4WD. Take the road out of Tharwa, and remain on the road for about 10km. Take the signed road to Honey Suckle Creek. Very important historical site, this is where the signals from the Apollo 11 space landing were received, and then beamed around the world. Also a nice drive, and a very good camp ground. Remaining on the road for another ten kilometers, entering the Namadgi National park, and two hundred meters after a single lane bridge is a signed turn off to Yankee's Hat. This is a four km drive, any car can take it, and look for Kangaroos. Hundreds either side of the road. The walk to Yankee's hat will take you to see aboriginal art. Road to Adaminaby. If you have a robust vehicle, take the road south. The country is magnificent. It takes about an hour from Yankee's hat. 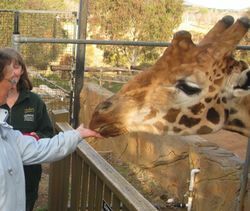 Visit the National Zoo and Aquarium, 999 Lady Denman Drive, Weston Creek ACT 2611. (Take Parkes way and follow directions), ☎ (02) 62878400, . This privately owned zoo and aquarium offers the standard service plus special tours that allow interaction with the animals. The range of tours offers opportunities to interact with animals (feed or touch) including tigers, lions, cheetahs, giraffes, bears, dingos, elands and snakes. The tours are quite special and certainly worth it if you love animals. Make sure that you turn up at the 'Check in time' instead of the start time as the two are different. The Australian National University (ANU)  is in the suburb of Acton, relatively close to the city centre. It is highly regarded internationally and one of the top 20 universities in the world. Locally known for its expansive green campus. The University of Canberra (UC)  in the suburb of Bruce (about 8 km (5 miles) NW of the CBD). The Australian International Hotel School (AIHS)  awards undergraduate and graduate degrees in business and hospitality fields, and is well regarded internationally. The Australian Defence Force Academy (ADFA) , a faculty of The University of NSW , provides teaching for military and civilian undergraduates and postgraduates. Canberra Antiques Centre, Ph/Fax: (02) 61623737, . 10AM - 5PM seven days at 37 Townsville Street, Fyshwick. Over a dozen professional dealers, both local and interstate, offer a top variety of antique and retro furniture, funky vintage clothing, vintage fabrics, militaria, numismatics, pottery, vintage needlework tools & accessories, electricals, silver, art glass, quality bric-a-brac and designer items. Well presented with great music playing and a nice vibe throughout. Jamison market - every Sunday near Jamison centre, in Belconnen. Fresh produce stalls and flea market. Come and get your bargain. Vinyl records, second hand clothing, furniture, bric-a-brac. Old Bus Depot Market, every Sunday. Arts and crafts – all of a high standard. Food stalls, including fresh produce and live music. Theme days such as international food held occasionally. Tuggeranong Market - First Sunday of every month in the lovely Tuggeranong Homestead opposite the Calwell Shops. Lots of stalls, selling amazing stuff. Trash and Treasure Market in Woden is hosted by Rotary and held every Sunday morning. Expect a mixed bag of books, plants, and assorted household junk. Fyshwick Market, Dalby St (Cnr Mildura St) Fyshwick, tel +61 2 6295-0606. - Fresh produce, including fruit, vegetables, meat and fish. Open Thursday to Sunday. Sunday afternoons are a good time to pick up some bargains. Belconnen Market, Lathlain St, Belconnen (off Benjamin Way), ACT | Telephone: +61 2 6251-1680 | Fax: +61 2 6251-7721, . The Markets are open from 8:00AM to 6:00PM Wednesday to Sunday. Some stores now open 7 days a week. Thursday's is senior's day with 10% discounts. Capital Region Farmers Market, . EPIC (Well Station Road near Federal Highway, North Canberra) - Saturday mornings 8AM to 11AM. Sellers are the producers. Stalls are all food related. Southside Farmers Market, . Woden CIT (formerly Woden High School) (Ainsworth Street near Hindmarsh Drive, Phillip) - Sunday mornings 9AM to 12PM. Sellers are the producers. Stalls are all food related. Canberra Centre  is a large shopping mall in Civic, covering a large section of the central Canberra shopping district. It has department stores, food hall and eateries, specialty shops for adults and kids fashion both upmarket and basic. There are also electronics, books, CDs, souvenirs and Australian made products. City Walk is an outdoor mall area in Civic. There is alfresco eating and shopping. Belconnen Mall is the name of the enclosed shopping centre owned by Westfield located within the Belconnen Town Centre to the north. Although it does not have as many clothes stores, it features a 'Myer' department store and a 'K-mart', as well as three supermarkets and a food court. It is located over three levels. Note that the location of the bus stop/interchange moved to the opposite side of the centre in May 2009. Woden Westfield and Tuggeranong Hyperdome are the two major enclosed shopping centres to the south, located within the Woden and Tuggeranong town centres respectively. Woden Plaza features a 'David Jones' department store, a 'BIG W', two supermarkets, as well as approximately 200 specialty stores and a food court. The Tuggeranong Hyperdome (further south) features a 'K-mart' and a 'Target', as well as supermarkets and a food court plus specialty clothing stores. Fyshwick is the suburb to shop for appliances and technical stuff, along with furniture and homewares. It is also Canberra's 'red-light' district. Most of Canberra's antique shops can also be found here. Fyshwick now has a DFO - Direct Factory Outlet. Lonsdale St in Braddon (close to Civic) houses a handful of boutiques, specialising in independent clothing labels and other designer objects. Manuka is another area that has boutiques and restaurants. Millers of Manuka boutique sells leading women's fashion brands like Max Mara and others. For less expensive women's clothing try Witchery. Booklovers would do well to check out Paperchain bookstore. Kingston is yet another shopping and restaurant area not far from Manuka. Many of the most interesting shopping experiences are at the national institutions, almost all of which have specialist shops inside. The National Gallery has a superb range of art books, both overseas and indigenous. Likewise the National Library, the Questacon Science Museum, the War Memorial, the National Museum at Acton, the Film and Sound Archive, and so on - if you're looking for unique Australian items, these are the places to go. Canberra has many fine eateries, but beware - many will be closed on Sundays. All public buildings in Canberra are smoke free. Civic Asian Noodle House Sydney Building, 34 Northbourne Avenue, ph (02) 6247 5145. Good laksa at reasonable prices ($15). Relaxed atmosphere. Dumpling Inn 1/1 Lawry Place, Jamison Group Centre, Macquarie. Excellent Chinese food with Yum Cha lunch on Saturday and Sunday. Very popular with locals and booking might be required. ph + 61 2 6253 2268. Griffith Vietnamese Restaurant, Griffith Shops. Cheap, no frills place. Popular with many locals, diplomats, and politicians with their praise adorning the walls. The owner/chef is well known for customising the menu for your tastes - be sure to ask for yummy chicken, or yummy rice, or yummy seafood hot pot. Hansel & Gretel 42 Townsend St. Philip. Great European style shop and cafe. Canberra's best coffee is roasted and sold on the premises. Also great selection of nuts, chocolates, and Easter and Christmas treats. The cafe serves healthy light lunches and a selection of cakes and biscuits. Kingsland Vegan Restaurant  5/28 Challis St, Dickson. Chinese-style tofu, noodle and faux meat dishes, free of all animal products. Super cheap on Tue/Wed evenings with discount for cash. Tel: +61 2 6262 9350. Pide House, 2 Lawry Place, Jamison Group Centre, Macquarie (near Belconnen T/C) and Woden Plaza, Corinna Street, Woden. tel +61 2 6251-3325 (Jamison) and +61 2 6260-3016 (Woden), . Nice, inexpensive Turkish food in a proper restaurant (not a takeaway outlet). The Woden location is open all day (one of the very few in Canberra). The Flute Bakery, 8 Barrier St, Fyshwick. Only open during the week. A fantastic french bakery with an extensive and delcious range of sweets and savouries. The Front Gallery and Cafe, Lyneham Shops, Wattle Street, Lyneham. Enjoy a coffee and explore an art exhibition. Comfy couches. 8AM – 10PM Tues - Sat & 8AM – 6PM Sun - Mon. Yarralumla Halal Pide House 45 Novar St Yarralumla. +61 2 6281 1991. High quality Turkish at a reasonable price, no alcohol allowed on premises. Absolutely delicious kebab rolls - local favourite. Take away available. Zambrero  Cnr East Row & Alinga St Civic (near bus interchange). Locally-owned Mexican cuisine serving fresh burritos, tacos, and nachos. Good vegan options are available. The Civic store is open late night Saturday. Other stores can be found in Woden, Dickson, Belconnen and multiple other locations. Blue Olive Cafe, 56 Alinga St, Canberra tel +61 2 6230 4600. Famous for their delicious New York style sandwiches. Great coffee and breakfast menu, wonderful service. Brodburger  11 Wentworth Ave, Kingston (behind the Canberra Glassworks) +61 2 6162 0793. Once located on the shores of Lake Burley Griffin in a small red caravan, the new and improved Brodburger is arguably the best burger in Canberra. Because of this reputation, the wait times can be a bit long, and you may have to wait for a place to sit (no reservations are taken) but it's worth it. You can choose the cheese you want (hello beef and blue cheese! ), and the burgers are cooked to perfection with added home-made aioli. Popular with Canberra's hipsters. Bruno's Truffles, Unit 2, 106 Mawson Place, Mawson. tel +61 2 6286-6377. Nice cafe and shop for locally made chocolates and pastries. Cafe D'Lish, Shop 3, Duff Place, Deakin. tel +61 2 6281-3533. fax +61 2 6281-3450. Swiss owner, nice pastries made on premises. Dickson shops: This is the Canberra equivalent of Chinatown. Lots of great Asian food and a few pubs/clubs to have a beer at. This shopping centre is located a 10 minute bus ride north of Civic, just off Northbourne Avenue, and has a fantastic eat street, with everything from Thai to Turkish to Vietnamese at reasonable prices. Turk Oz has a delicious spinach and feta pide. Dickson Noodle House makes a terrific Laksa and is quite cheap. Au Lac is an excellent vegetarian Vietnamese place with delicious soy-based versions of everything. Ginseng, 15 Flinders Way, Manuka. tel +61 2 6260 8346 or +61 2 6260 8347. Try either the traditional or vegetarian Singapore noodle and the Laksa. Book in advance and ask for a table on the second floor, you will get the best view of the Manuka tree tops!! Happy's Chinese Restaurant  Located right in the heart of Canberra City in Garema Place, Happy's Chinese Restaurant offers traditional Cantonese cuisine in a quiet and friendly atmosphere. Opened in 1962 it is the oldest Chinese Restaurant in Canberra. Mr Happy has now passed on, however his grandson Gavin now owns and operates. Italo-Australian Club Franlin St, Forrest. You can obtain a temporary 28 day membership for $1 upon entry. You can get a hearty Italian pasta dish for around $15, with drinks both alcoholic and non-alcoholic reasonably priced. Koko Black Bunda St Canberra Centre North Quarter. Warm and tasty Chocolate shop with a second to none chocolate selection as well as a innovative and interesting Hot Chocolate and Drink Menu. Nice, welcoming decor. Maestral Seafood Restaurant, 13 Trenerry Street, Weston Creek. tel +61 2 6287 3930.. Mediterranean/Croatian, lots of fresh seafood and steak. Former Prime Minister John Howard ate here! Rama's, Shop 6, Pearce Shopping Centre, Hodgson Crescent, Pearce. tel +61 2 6286 1964 or +61 2 6286 9437. Fijian/Indian, best (and hottest - no joke) curries in town. Can be very noisy. Sammy's Kitchen Bunda St Canberra Centre North Quarter. Serving a menu inspired mainly by Malaysian but also Cantonese flavoures. Another restaurant with cool and sometimes almost yuppy feel. Silo Bakery and Cafe, 36 Giles St, Kingston. tel +61 2 6260-6060, . Good breakfast, however almost always very crowded - expect 'attitude' instead of service. They also have a dedicated cheese room. Tu Do, 7 Sargood St, O'Connor. tel +61 2 6248 6030. Cheap and tasty Vietnamese, very popular with the local Vietnamese community. Good bar nearby too. Aubergine Restaurant, 18 Barker St, Griffith. tel +61 2 6260-8666. Food is very good, but beware the cancellations policy when changing a booking - you could be charged for the meals your party did not eat. Courgette Restaurant, 54 Marcus Clarke St, Acton. tel +61 2 6247-4042. Sister restaurant to Aubergine Restaurant, fine dining. Italian and Sons  7 Lonsdale St, Canberra. Tel +61 2 6162 4888. Authentic, seasonal approach to Italian food using produce sourced from local growers and their own farm yard. Ottoman Cuisine Restaurant, Cnr Broughton & Blackall St Barton. tel +61 2 6273-6111. Consistently awarded best Turkish in Australia, great atmosphere. Rubicon 6A Barker St, Griffith. Tel 6295 9919. Consistently excellent food, extensive winelist and BYO (bring your own) are accepted. Great atmosphere, romantic rear indoor courtyard. The Artisan 16 Iluka St, Narrabundah. Tel +61 2 6232 6482. Chef run restaurant with a focus on pairing good food with good wine. The Ginger Room, located in Old Parliament House, the Ginger Room offers fine dining, in either a two course, or three course meal option. Food offerings can be inconsistent in quality but if it is good, it's really good. The Promenade Cafe at the Hyatt Hotel, Commonwealth Ave, offers daily buffet dinners in its restaurant from 6PM and high teas from 3 to 5PM. Canberra's many bars and clubs will be closed on Sunday nights and early into the week. Civic can appear to be a ghost town but there are areas such as Bunda Street where you will always find something happening. Kingston Hotel (Off Canberra Avenue, near Manuka Oval). One of Canberra's longest running pubs, offering a 'cook your own' style open grill bistro, comprehensive restaurant, several pool halls, a drive-through bottle shop and bare bones backpackers accommodation (though usually occupied by long-term tenants). Once notorious for being rough, it is now a safe and friendly pub. Same ownership as Civic Pub and Uni Pub. King O'Malleys in Civic (inside City Walk Hotel building, Ground floor). Large Irish pub with a relaxed atmosphere, does pub-style meals lunch and dinner with some type of live music on most nights. A true home for all types. The Wig and Pen  Ground Floor, Australian National University School of Music, 6248 0171, . Serves a wide range of award winning beers brewed on the premises, as well as a selection of other boutique and independent brews. The Phoenix, 21 East Row Canberra City, 6247 1606. About as rustic and dingy as a Canberra establishment is likely to get, this pub attracts a varied crowd, with more than its fair share of bohemian types. Live music most nights, and an extensive range of whisky. Hippo Lounge (Upstairs, Garema Place, Civic). Cocktail bar with an intimate setting amidst Baroque-meets-student-digs decor. There's also live Jazz on Wednesday nights. PJ O'Reilly's (West Row - City). Another Irish themed bar like King O'Malley's. Mooseheads  (East Row - London Cct - City). A bar with local history. Recently burnt down and restored, Mooseheads is famous as an Australian Defence Force Academy (ADFA) hangout. Tilley's Devine Cafe Gallery (Lyneham Shops). Originally a "female only" establishment, it now opens it's doors to everyone and is a fantastic venue for acoustic and jazz local and international acts. Food and coffee available, along with a large bar selection. Public Bar (Cnr Franklin St & Flinders Way, Manuka). A popular hang out for the under 40's crowd. Extensive wine and spirits list, with a nice outdoor area for people watching. Dickson Central : Dickson 3km from City. Canberra City YHA, 7 Akuna Street, Canberra City, tel +61 2 6248-9155 ([email protected]), (Fax:+61 2 6249-1731), . Beds in a shared dormitory from $26 per night. Double or twin rooms from $76 per night. Family rooms $96 per night. Victor Lodge, 29 Dawes St, Kingston, +61 +61 2 6295-7777 ([email protected]), (Fax:+61 +61 2 6295-2466'), . Reception 7:30AM-9PM. Kitchen is only open from 11AM-9PM but breakfast is provided and included in the rates. Free parking. Shops, cafes and grocery store are nearby. Dorm beds from $27. Rydges Eagle Hawk Resort, Federal Highway. ph +61 2 6241-6033. fax +61 2 6241-3691. email [email protected], . A large resort, a few kilometers from the outskirts of Canberra, with motel-style accommodation. It is on the Federal Highway just across the border. Rooms include small kitchenettes, and it is possible to get two interconnecting rooms for families or groups (at less than the price of two rooms). The resort has a large pool, a breakfast room and restaurant, and a small spa and sauna area. Double rooms $140 per night without breakfast and $170 with breakfast. Rates may be as low as $110 if you pay in advance and agree to a 48 hr cancellation period via the Rydges Direct system. Novotel Canberra Hotel, 65 Northbourne Avenue, Canberra ACT 2600 - Ph: +61 2 6245-5000 Fax: 6245 5100 E: [email protected], . In Canberra's Civic Centre on Northbourne Ave, Novotel Canberra accommodates business and convention visitors, and families travelling with children. Directly above the Canberra Coach Terminal. Rate range $150 - 250. There are a number of Bed and Breakfast places just off Northbourne Avenue, in Canberra's inner north. These tend to be mid-range, cost-wise, but are comfortable and refreshing if you are looking for a 'home away from home'. Serviced, short-term apartments are widely available throughout Canberra and are available for stays as short as one night. Amenities typically include kitchen, washer and dryer, and separate bedrooms. A full range of properties exist from budget to 5 star. Canberra is a very safe city and enjoys one of the lowest crime rates in all of Australia. However, be cautious, especially around bus interchanges, where some youths may tend to be hostile. Despite its apparent affluence, Canberra has people who live 'rough'. Particularly around Civic, it is not unusual to be asked for money. This is a well-organised activity targeting both visitors and locals: if you simply say that you don't have any money, the beggar (real or fake) will usually move on to the next available person. There are no public lockers. If you want to store your luggage, book a room or keep it at a friend's place. The National Library of Australia provides free WiFi and free internet access from its 40 computer terminals (webmail is blocked on some computers, so ask the staff to show you which ones you can access webmail from). The library is located adjacent to Commonwealth Avenue Bridge on the southern side of Lake Burley Griffin near the National Gallery of Australia and Questacon. It is open 9AM-9PM Monday-Thursday, 9AM-5PM Friday-Saturday and 1.30PM-5PM on Sundays. There is also free internet available at all of the public libraries in Canberra, though the terminals at Tuggeranong may be occupied during school hours by students of the college next door since it is a dual-use library. Membership is not required, but you may have to book a few hours in advance due to high demand. McDonald's restaurants in the ACT offer free WiFi, no purchase required. Full list of participating restaurants available at ; there is one in the Civic bus interchange in the city centre. Service is subject to content filtering and session download limits. The Pancake Parlour at Civic (in the Sydney Building, near bus bay 4) also offers free Wi-Fi to customers, along with power points at several tables. The Barracks LAN Games & Internet Cafe located in the Bus Interchange in Civic offers pay for use internet and gaming. It goes without saying that it smells like a 13 year old's room in there. This is a list of foreign missions in Canberra. Some countries may have their representative in other cities, and Department of Foreign Affairs keeps a complete list . Queanbeyan - located just across the NSW border. Many people live in Queanbeyan and work in Canberra. Goulburn - Country town, worth a visit if you are travelling onward to Sydney. Snowy Mountains - the New South Wales and Victorian ski fields are only a 2.5 - 3 hour drive from Canberra, via car or bus. Keep an eye out for Kangaroos and Wombats if you are driving. Batemans Bay - the closest ocean beaches to Canberra - 115 minutes away. Collector - a small historic town 30 minutes drive north of Canberra ideal for a day trip. Famous for a kidnap and murder by bushrangers. Gundaroo - a small historic town north of Canberrra, you can follow the range from Gundaroo through to Collector as an scenic alternative to the federal highway. Some dirt roads involved (between Gundaroo and Collector, the road between Canberra and Gundaroo is all sealed). Bungendore - a small historic town 20 minutes drive from central Canberra, via Queanbeyan. It has an award winning wood gallery  and associated cafe and many interesting places to eat, shop or stay. This page was last edited on 13 February 2019, at 04:46.